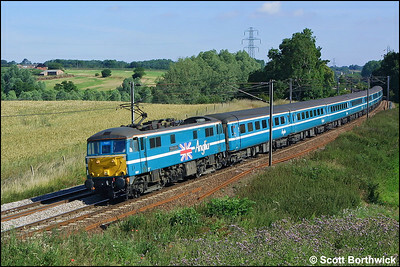 This gallery contains every photograph of a Class 86 locomotive on this site. 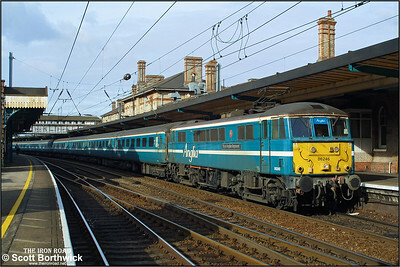 If you wish to be more selective, please take a look at any of the Class 86 "themed galleries". 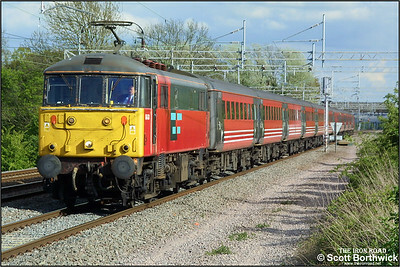 86424 on hire to Virgin West Coast works a northbound service from London Euston at Cathiron on 01/05/2002. 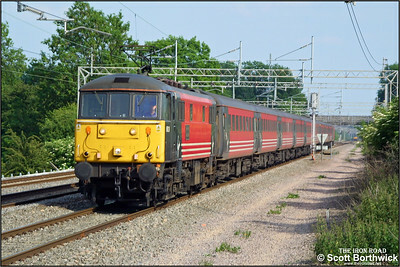 86260 'Driver Wallace Oakes GC' works a diverted London Euston-Wolverhampton service at Cathiron on 13/07/2002. 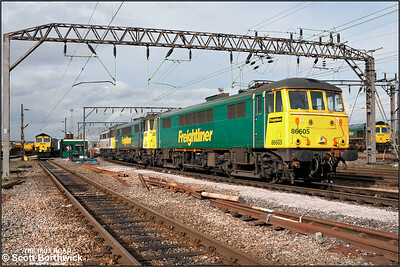 The train would be dragged by a diesel locomotive from Nuneaton to Birmingham New Street. 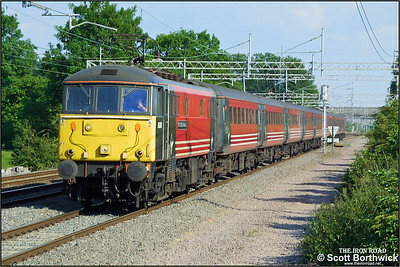 86233 'Alstom Heritage' stands at Nuneaton after arriving with 1V84 1003 Glasgow Central-Penzance on 18/08/2002. The loco is awaiting detaching in order that 47840+47847 can be attached to the other end of the train and work forward to Penzance. 86612 'Elizabeth Garrett Anderson'+86613+90041 dodge the shadows as they haul a very lightly loaded southbound freightliner at Cathiron on 04/02/2003. 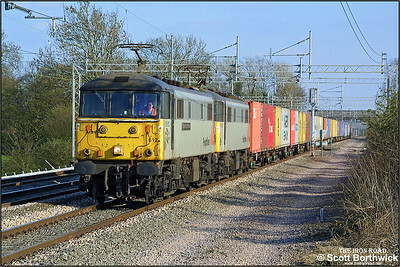 86612 'Elizabeth Garrett Anderson'+86623 power 4M87 1249 Ipswich Yard-Trafford Park at Cathiron on 08/04/2003. 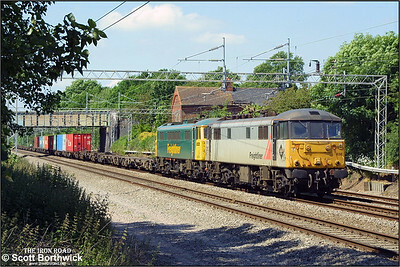 Although at the time stored due to transformer defects, 86261 'The Rail Charter Partership' was used to demonstrate how a loco is lifted from its bogies during the 2003 Crewe Works Open Weekend. 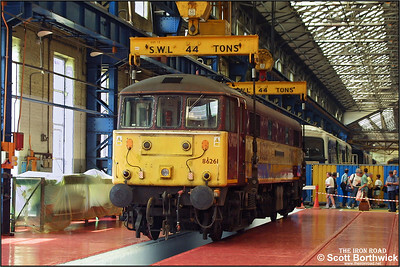 Several displays were given throughout each day of the event and here the loco is seen prior to being lifted on 31/05/2003. 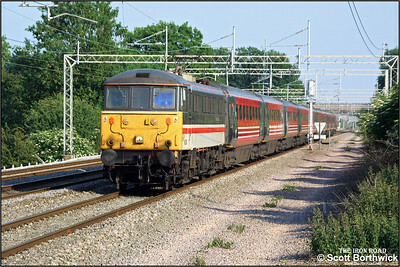 86212 'Preston Guild 1328-1992' speeds north at Nuneaton with a Virgin West Coast service from London Euston on 04/06/2003. 86611 'Airey Neave'+86631 power 4M87 1249 Ipswich Yard-Trafford Park passing Cathiron on 13/06/2003. 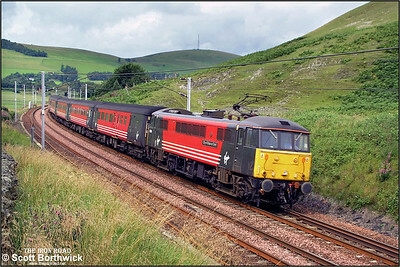 86260 'Driver Wallace Oakes GC' heads north at Cathiron whilst in charge of a Virgin West Coast service from London Euston on 13/06/2003. 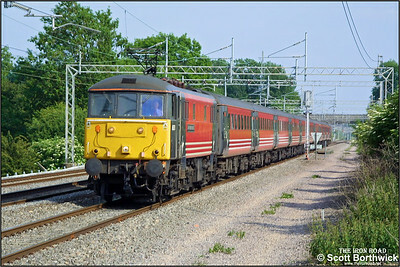 86229 'Lions Club International' passes Cathiron with a Virgin West Coast service from London Euston on 13/06/2003. 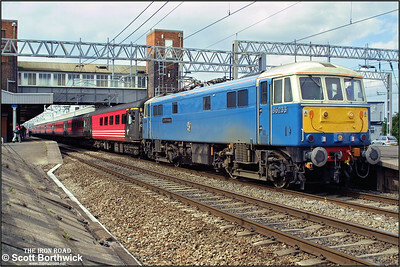 86228 'Vulcan Heritage' passes Cathiron whilst in charge of 1F21 1700 London Euston-Liverpool Lime Street on 13/06/2003. 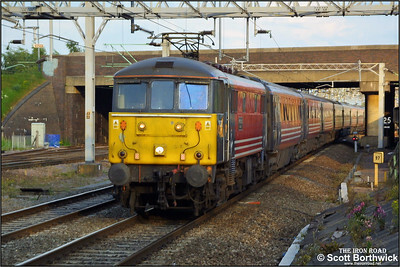 86233 'Alstom Heritage' works 1C20 1530 London Euston-Carlisle at Weedon Bec on 04/09/2003. 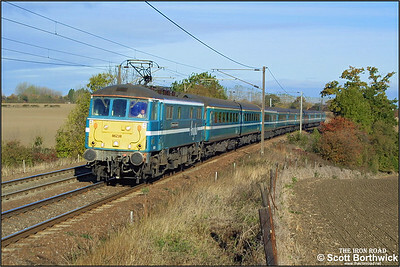 86238 'European Community' passes Dagworth whilst working 1P25 0940 Norwich-London Liverpool Street on 25/10/2003. 86246 'Royal Anglian Regiment' pauses at Ipswich whilst working 1P33 1140 Norwich-London Liverpool Street on 25/10/2003. 86638+86605 pass Cathiron with 4L75 1014 MX Trafford Park-Ipswich Yard on 07/06/2004 running additionally on a Monday. 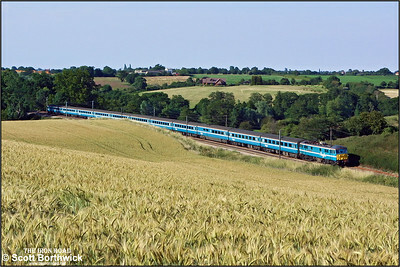 86227 'Golden Jubilee', or simply 'The Flag' as it was known, passes Brantham in charge of 1P21 0830 Norwich-London Liverpool Street on 06/07/2004. 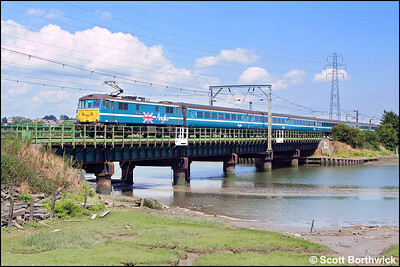 86227 'Golden Jubilee' works 1P39 1300 Norwich-London Liverpool Street across the River Stour Viaduct, Manningtree on 06/07/2004. 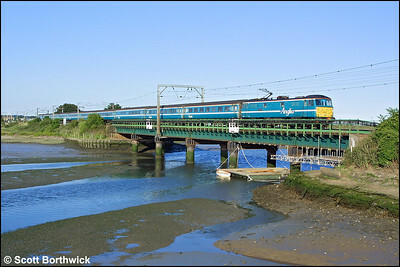 86235 'Crown Point' propels 1P26 1300 London Liverpool Street-Norwich across the River Stour Viaduct, Manningtree on 06/07/2004. 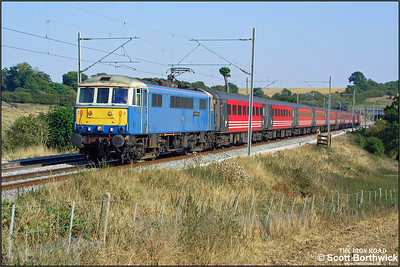 86235 'Crown Point' speeds past Brantham with 1P49 1540 Norwich-London Liverpool Street on 06/07/2004. 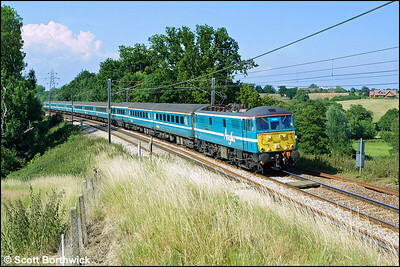 86246 'Royal Anglian Regiment' speeds 1P55 1700 Norwich-London Liverpool Street through the Suffolk countryside at Brantham on 06/07/2004. 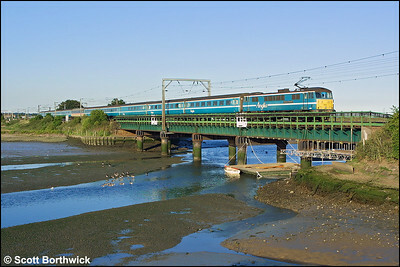 86235 'Crown Point' propels 1P48 1800 London Liverpool Street-Norwich across the River Stour Viaduct, Manningtree on 06/07/2004. 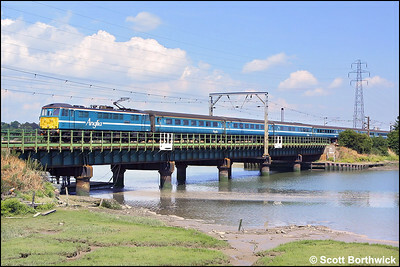 86238 'European Community' propels 1P50 1827 London Liverpool Street-Norwich across the River Stour Viaduct, Manningtree on 06/07/2004. 86605, 86627 & 86622 stabled between duties alongside Crewe Basford Hall LDC SS Middle signal box on 09/10/2005. (With permission).